Hey friends! Phew, what a crazy few weeks it has been but we are thrilled to finally be able to take you on a little initial tour of our new (old) mid-century brick rambler! Yeah, did you ever imagine that I would buy a ranch-style one level house with a basement? I actually didn’t think we would ever buy a mid-century rambler. Not that I am anti-midcentury ranch houses at all, they are cool, but you know me, usually I’d say I’m a cottage/farmhouse/craftsman/fairytale lovin’ house girl. Of course, I guess I shouldn’t be totally surprised that we bought a house from a different era, since our last house was a brand new house when we’d always lived in older 1920s and 1930s houses. But regardless of its shape, size, age, or style, I just knew it would be right for us and we’d be happy there making a house a home. I have tons to share about the short and longer term ideas we have for this house. I also have a preliminary vision for each room and the exterior that I am excited to share with you in upcoming posts! But because there is so much to share and dream about, I wanted to start with a video tour to give you a little sneak peek. In case you can’t see the embedded video above, click here to find the tour! So, what were some of the reasons we felt this house would suit us? Gorgeous natural light — This house is bright and cheery all times of the day on the main floor AND in the basement, even on a cloudy day. That was a big deal. Our old house had beautiful light that streamed through big windows, so I knew what a difference light made in our day-to-day experience. Most of our previous houses had big trees that blocked the light, so this time we knew we should intentionally look for a house that had trees within view, but not so close that they that blocked light. A sense of space — This house isn’t big, but it has a feeling of spaciousness. With the large expanses of windows with wide views of the sky, the sense of space is increased and it makes you feel like you have plenty of room to breathe. I loved that the house has a separate living room, dining room and kitchen, but they all flow together which makes the house feel more open (while still feeling cozy). I also love that it has a spacious basement for hanging out. A blank slate — Even though this is a unique era and style for us, I feel like the house has so much potential to become more our style through the addition of character, curb appeal, design details, furnishings and remodeling the kitchen and bathroom. 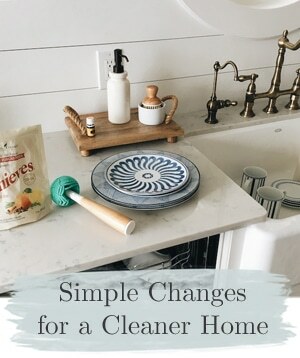 It was very clean and well-kept enough to move right in and start adding our own personal touches throughout the entire house. We knew there were so many projects we could do it to make it our own, it felt like it would be a fun and challenging house to work on. I especially love that there are projects we can do right away, too! The view — Never in a million years did we expect to get a view, but happy bonus, this house has amazing sunset and sky views, mountain, trees and Puget Sound views from the living room, dining room and kitchen. Every day just walking through the house and seeing the wide open views will feel like a gift. The location — This house is conveniently located within five miles of everything that we wanted to be close to. It’s also in an established area where many people are improving their homes, which is great for resale. A quiet oasis — Seattle is a big city. There are a lot of people and loud cars. I love the excitement, but when I am at home I don’t want to hear or dodge cars and traffic on my own street. I don’t want to live IN a city, so the location and setting of this house on a large, more private lot will feel like we will have a retreat, a true escape. Even the backyard is private and has beautifully manicured old growth shrubs and trees that make it feel like an oasis. Just seeing some of our furniture coming in the house makes me excited to start getting settled (even though right now we have random decor strewn about and bins and boxes piling up all over the place, ha!). I’ll have a post soon sharing our ‘moving in’ process, and some of our best tips for planning a move. If you missed our ‘moving out’ post, find that here! Stay tuned, we’ll be going room by room through the house sharing our vision, inspiration rooms, and short and long term plans for each space! Yes! I noticed the stove, too. So cool. Great house. I noticed that too! So cool! Lots of potential in that house. My mom had a stove like that, and it was great! I remember seeing a rerun of Bewitched and being surprised that Samantha had one of those stoves, too. Storage cabinet underneath, pull out burners (pull out halfway for a couple of burners, or pull all out for a big meal, and two ovens. Love it! That laundry room is so nice and large! The brick fireplaces, the backyard, the views….can’t wait to see what you do with this new home. And, I love your quote at the end. Blessings to your family as you settle in! Cannot wait to see what you do to make it your own! Hurray! So happy for you! It’s a great house and your video is so cute. Looking forward to you making it your new home! Congratulations:) Love, love your new house! Like you said the lightening looks fabulous & even in the basement (bonus!!). Go get yourself a barre dvd & you’re all set to exercise:) I envy your fab laundry room!! Look forward to your upcoming posts!! It’s wonderful already! What a view. No doubt you’ll turn it into the home you want it to be. 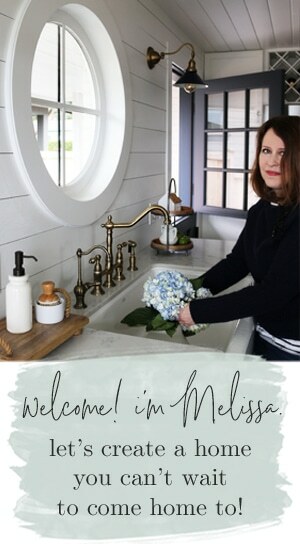 Melissa – it looks beautiful! Congratulations! I’m so happy for you and I know you’ll put your stamp all over this house! What a view you have. Love the rooms and the light! I’ll be excited to see it as you make it yours. My daughter used to live across the bridge from Seattle in Bellevue. This is such a lovely area and I wish you and your family the best. OH my goodness, what amazing “bones!” I can’t even wait to see what you do with it, and am so happy that you found the perfect for you house. And those views!! Wow. Ditto on all of the comments above: can’t wait to see what you do with your new home! This is why you buy the house, not the style. Beautiful homes; can see what some projects will be but how lucky you are to find a home pretty-much move-in ready. Looking forward to the next year or more of re-familying of this house—>home. I can’t wait to see how you put your own unique stamp on this home! I love it! And, I cannot wait to see what you do to make it your special haven. We have a similar mid century home in Ohio. You always inspire me! God Bless your new home:) You are going to have such a great time of decorating and putting your own touches on this home sweet home! I just know you’re going to inspire me to move ahead in making my own new place feel a bit more like home. This house has it all! Great view, good bones and major potential! Good for you! (I cannot wait to see the “new” master bath, LOL). Congratulations! What an amazing view and laundry room! Love everything about it! I happen to love mid-century, although I don’t actually live in one. The laundry room is amazing. So happy for you!!! Congratulations!!! It was so fun to see a sneak peak. I can’t wait to see how you decorate! Congratulations! I can’t wait to see you add your magic. Congratulations! You have lovely taste, I can’t wait to follow along as you move in and make it your own. I love the BIG laundry room and basement! Congrats – great looking house and lots of design options. Looking forward to future posts. But, I guess I’ll be the first to ask – how steep is that driveway and do you have many ice storms in Seattle? I used to live in Syracuse NY and remember backing down roads since my little car couldn’t get up in the snow & ice. I love it, the natural light is amazing! Once the doors were open I immediately imagined all the charming details you could add. I can’t wait to see you turn it into your home. Congratulations! I love it! I love that exercise room, with the mirror and the barre. I live in Seattle too, so can appreciate the awesomeness of seeing some of the sound! Much LOVE & many BLESSINGS as you begin this journey. I think you will be very happy in this home! Welcome to your new home! I think it is wonderful and cannot wait to see what is done to each room. It will be a labor of love. My biggest and most difficult decision right now is trying to decide what color to have our kitchen cabinets painted. After a kitchen remodel I cannot imagine doing each room. ☺️ Many blessing in your new home for years to come. I enjoy your blog tremendously. Can’t wait to follow more! I’m so excited for you and your family and can’t wait to see your touches on your new home. We have seriously thought about downsizing from our current old Dutch colonial to this style of house, so this will be so much fun to see what you do! Congratulations. We lived in Olympia for awhile and I have to admit, you kinda made me miss the area. I cannot wait to see what you do with this home. Love the views. Looks like you’re just down the road from me in Olympic Manor; a community of cool mid century ranch style homes. If so, be prepared to light up your house at Christmas time … one of our traditions is driving through the community and seeing all the wonderful light displays. They also have a community wide garage sale (great for thrifting!). And you’re just uphill from Golden Gardens and the marina. Congratulations on your new home, Melissa. God is good! Looking forward to your updates on decorating. It looks like a spacious, well lit home, with a great view. That view is enough to get you through any temporary decorating waits! I hope it turns out to be a blessing for your family and your church. Oh, there is so much light and so much potential! Love your peek a boo view too! Congratulations! I know it’s going to be so beautiful. I was enamored with that stove though. Wow! I’ve never seen anything like it. What a lovely home! That view! Congrats to you and I look forward to following along as you make it your home. What a cute house- I love it! You’re right. So different from your last place, but a wonderful space with tons of potential. Can’t wait to see what you do with it! Oh how exciting! A fresh, new start with an awesome new home. Looks really well kept and all those rooms with so many possibilities. Can’t wait to see what you do with it. Your views are amazing and love the stove! Congratulations! Love Henry Van Dyke’s words! CONGRATULATIONS and I know you will love getting your hands on this great house to make it a home. Can’t wait to see! Nothing like a view to bring a sense of peace. Can’t wait to see you bring this home alive. Thanks for sharing your new home! Can’t wait to see what you’ll do next! 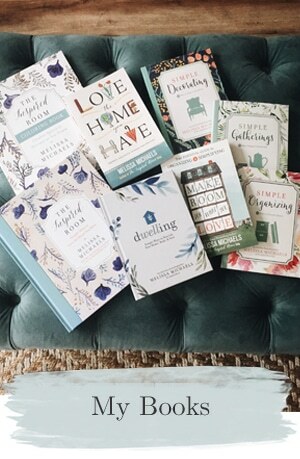 Your book has shown me how to truly “love the home I have”. Thank you, thank you!! You have a ballet bar with mirrors!? Jealous! I hope your new house feels like home soon! What a wonderful and blessed adventure for your family. 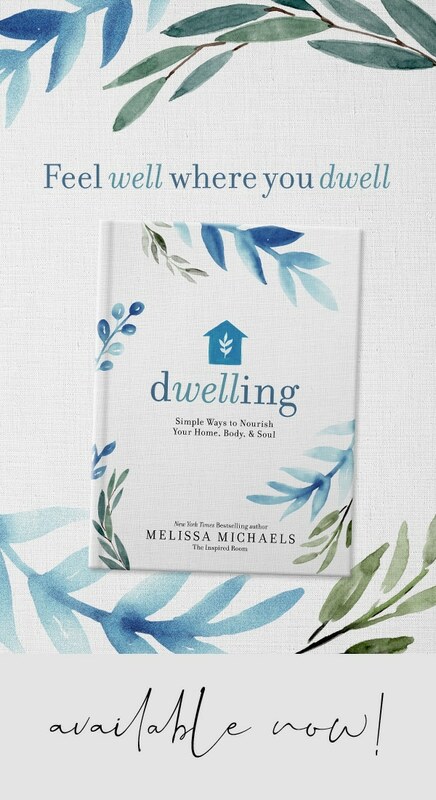 Melissa, I’m so excited for you, and can’t wait to see how you put your own stamp on this new house! I know it’ll be great. The views are just fabulous! our son lives in Seattle, Gasworks Park area, and we know how hard it is to get a view AND space. Light in the basement–what a find! Lotsa DIY’s on the horizon and “projects” AND so much creative juice flowing. I responded to the view right away, the light, the laundry room. I looked at a Frank Lloyd Wright sort of house the other day–knew I would be doing huge projects 4ever and decided at age 68, I’m just not there anymore. Very hard not to dream about all the changes I could make and would need to make. So, we’re adding on an art studio to our existing newer home and I’ll put my create-time to good use in that room. LOVE that you found a “home” to be in. I love Seattle, as in I love Seattle! Melissa, I am grinning from ear to ear with excitement for you and your family. What a wonderful family home with great bones and i agree, great potential, it will soon get the Melissa touch and become yours inside and out. That view is amazing and one you will truly enjoy. Can’t wait to follow along with your journey. Looks like we both will be enjoying making our new houses our new HOME!!!! I LOVE IT! AND how did I miss that you have a doodle? I have a golden-doodle too named Molly or as she’s known on the street, Princess Molly! She really is a whack-a-doodle! A wonderful home – although that driveway will be a pain in the winter. The huge laundry room, the finished basement and the potential for the other rooms are marvelous. I’ve always thought the kitchen ranges with the attached oven above was the best idea ever. I’m always happy to at least see one still standing somewhere – at least for nostalgia’s sake. Enjoy your new adventure. Congratulations! I can’t wait to see what you do with it. So excited for you and your new home! I’m especially eager to see your plans for that green bathroom! Wow… You will have so much fun with this home.. Congrats and pat yourself on the back for all that you have been thru.. So excited to see the changes you will make.. Take a deep breath.. Your home!!! Adorable! I can’t wait to follow along as you turn this house into your home. And those views are amazing! Congrats!! I LOVE it!!! Great video, can’t wait to see what you do with it! I love the stove in the kitchen!! Have fun, and congrats! Hi Melissa, congrats on your new home….can’t wait to see how you will decorate. Greetings from Olympia!!!!! Given the style and view…I think we’re practically neighbors! We started with an original Seattle mid-century rambler as well, and have transformed it as well! :) Enjoy!! Love it! It has amazing potiential like you said. I’m betting you are opening the kitchen up to the dining room. Cant wait to see what you do first! Your home sounds like such a dream! Literally everything that you said are some of the benefits of your home are the things I have as a wishlist on my home. It sounds gorgeous and the few photos you’ve posted are stunning. Your home is the epitome of lovely. Thanks for giving us a fun little glimpse of it. Congratulations! You know what they say about location, and that view! Love the brightness of the basement as well. You will have it looking like home in no time, and I look forward to seeing your plans as well. Blessings on your new adventure. The dogs look so happy too! But then they always are when they are with the ones they love! AWE, so excited for you!!!! I loved the tour – what an adventure to begin to make it your own. Love the natural light! Congrats guys. I can’t wait to see how you transform it. I am excited like everyone else to see what you do-it will be amazing! I love the windows and the light, too! Did I miss a photo of the outside? Wow, the view is nice! Reminds me of a Hallmark movie! You made a great decision! My first reactions to it had to do with how light and bright it looked and the gorgeous views from those windows! Whoever built that house planned towards all of the beauty outside. I’m not a huge fan of that period either, but the nice thing is you can pretty much make it however you want it. I can’t wait to see future posts. Welcome home! Wow, what a beautiful location – oh, that view!! And how fortunate to also have a fireplace in the lower level – what a bonus that is! So happy for you guys Melissa! Can’t wait to see what you do with this house. I LOVE YOUR STYLE. Wow, what a nice view you have from the living room. I know you are probably itching to get started redecorating this house! I did cringe at the green bathroom. And not a big fan of those kitchen cabinets. But it is a lovely home, nonetheless and whatever you don’t like I know will be changed to something really beautiful. Good luck and many, many blessings! Sweet Happy Day…and oh my goodness are you going to have fun! Can’t wait to see what you do with each and every-room! and the lighting is divine! Congratulations from another transplant! We came to Seattle from New York 6 years ago. Your new home looks fantastic. The daylight basement and huge laundry room are amazing. Plus, a view! I know you will fill this new home with love. Thanks for sharing your new home with us! I’m looking forward to seeing what plans you have for it. I plan to downsize in the next year or two – so I appreciate all of your pre and post-move advice. The beautiful light, windows, view and that basement would have sold me on the house too! Excited to see what you do with it! I love the view.Its Heavenly! Waiting eagerly for your new adventure to unfold.I too will move next year (our apartment in a new city is under construction).I would love to learn how you do it all from Scratch?.Congratulations on your wonderful home.God Bless. Can’t wait to see how you decorate this cute house! I love the sign that you posted at the end of the video about Home Sweet Home…….where did you purchase that? I would love to have one!!! This is my new favorite-never-miss-a-post blog!! I know you aren’t new…but you’re new to me. :) I savor the posts and am so excited to watch the work on the house. Yay! Thank you, Britta! WELCOME! I’m so glad you found us here and I’m thrilled you’ll be along for the new house journey. Like you, I wouldn’t have thought a mid century ranch was my style. But wow, the video is fabulous and shows not only the potential that you will bring out with your talents, but the really fantastic house it already is! Thd light, the views, windows, space, slate entry, it’s very fab!! I love it!! Look forward to seeing your decorating! A very nice house, congratulations Melissa! I am sure you are going to work your magic and it will be as lovely as your previous home. A big blessing for you and your family during all this. Also for your work in church. Hi from Holland! I really love it! I would buy it in a second. I can’t wait to see what you do with it. Love your new place! Please don’t redo the master bath – it is so vintage-y cool – the pink and green tile colors remind me of my grandmother in law’s house. Hers was pink and gray tiled and I still have the pink hand towels she made for it 33 years later. Oh so many wonderful features in your new home! Have fun making it yours. Congratulations! It looks like a really awesome house. It’ll be a fun challenge being in a different style of house than is your natural persuasion. As an aside, is that swine in the entry? As an Australian, I am SO JEALOUS of your huge rooms, especially the laundry. Enjoy! Oh, my, you spotted it. :) Yeah. It’s there. And a few other places. Sigh. What a great house. Such good bones. I have been looking forward to this Post! Can not wait to see what the talented Melissa does with it. I love love the house and it so beautiful already! moving from a newer built house to a fifties ranch which is not your favorite style, me too. loving the charm of an older home me too; our first house was a 200 year old colonial. loving all the light from those extra large windows, me too. what to do with those short, high bedroom windows, me too. extra large basement with a fireplace and lots of windows, me too. can’t wait to make this new house a home, me too! Thank you for your wonderful posts and encouragement. I’m so happy that you are now living close to your girls again. WOW, we are kindred spirits! I’m so excited to hear that we’ll be on this journey together! Thanks for sharing and congratulations on your new home. YAY! wow! that was so fun to see!! i’m truly so excited for you. and msm’s are way cool and don’t have to look crazy out-of-touch. you go girl! Congratulations! When a house is right you just feel it and you can tell from the tour that this house has that special feeling. So many great features and as a bonus that gorgeous view! I’m excited to see how you put your stamp on it! what an amazing house !!! Can’t wait to see how you will organise it to feel like your home sweet home. I love your house! And can’t wait to see what you do with it. I have the same stove in my kitchen. I’ve thought of getting rid of it, but when clean there is nothing more beautiful seeing the stainless inside all lit up! And I have to admit, it’s the easiest thing to keep clean. Good luck with your new house. What a great house! A few years ago, I moved from a beachy cottage townhouse to a midcentury modern home – absolutely NOT what I was looking for and it took me a while to adjust but I adore it now. I look forward to seeing how you make this your home. My favorites – the stove and the pink and green bath. Both are so retro-licious! You are gonna love it. We too have a bit of a view and love having that. Just opens up the world from your home. I like the new house and can’t wait to see what you do with it. Jack and Lily seem to like it fine! Please, please, please tell me you are keeping the Stove and the bathroom! Beutifully mid-century! Lovely….so much potential. Excellent choice. It looks like such a cozy, warm home already. Can’t wait to see what you do with your new space And the view!! WOWSA! I’m also anxious to hear what Jack has to say about his new “digs”. :) Wishing you and your family all the best in your new home!!!! Oh how beautiful! What an amazing house that you’ll turn in to a home in no time at all. The views from your windows are priceless – now, that is truly a dream home! Looking forward to seeing pics as you settle in. Enjoy!!! So exciting! Cannot wait to see how the whole place comes together! That view is amazing and I know you are going to make the place lovely! if you aren’t already familiar with retrorenovation.com, now is definitely the time to check it out! so many awesome ideas and resources, as well as historical information on mid-century houses. love the spaciousness of your new house! all those windows are fantastic. Congratulations on a lovely place. I know I am probably alone but I like the crazy bathroom. I imagine it will be wonderful when you transform it, as will all the many changes you make. Congrats Melissa! The house is great and those views are unbelievable! I spotted those sliding mirrored closet doors – we have the same ones in our mid-century ranch too. I can’t wait to see what you do with them; I’m completely stumped! Wow! that view is amazing and I agree the light from the windows is AMAZING! That is one thing you can’t always add or change while you can make changes to other areas. 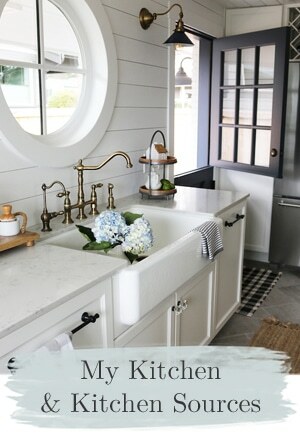 I am not a midcentury ranch style either – love the craftsman/farmhouse look too but I think with any house you can put your own touches on it. So can’t wait to see what you do! Congratulations Melissa! Can’t wait to see what you will do with the space! Love the house! I can see so much potential! I can’t wait to see what you do with it! Welcome to the neighborhood! You’ll love it here! We live on Sunset Hill and also have a house that we gradually want to make more “us”. Feel free to connect if you would like to get the skinny on where to get the best coffee, croissants,dentist and whatever else around here. CONGRATS!! Holy Cow, what a view! Really happy for you and thank you so much for sharing with us! So many things can happen, can’t wait to see! Caution ~ I grew up with a stove like that, nearly tipped over once when my brother tried to get some candy and used the burner drawer for a boost. that laundry room!!! I would die (it’s so huge!) That master bath… LOL! And an exercise room?! Melissa it will be so fun to watch you guys transform this home, I can see how it is a well structured blank slate to work with. Have fun! You and your daughters have such a great relationship that they were actually able to identify for you in your absence THE house that would fulfill your goals! Wow. And I am eager for myself to see what you do to make this house your own because I have a 60s ranch style. The updates I have seen involve an architect. That range!!! Probably completely impractical but love it and would be neat if you could keep it. I smiled at the big door bell chimes. Reminds me of the one in my grandma’s house. Thank you so much for sharing this move with us – you could have put up the “sorry busy for a little while” sign and we all would have understood but oh I’m so glad you didn’t – how much fun is it to be taken along for the ride. 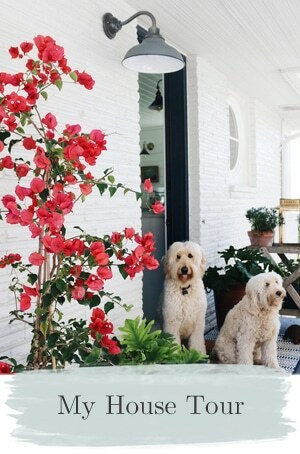 That house looks amazing and the dogs just too cute – I can’t wait to see how you transform it. Thank you again. Your my “go to” blog for everything homey. Love it !! I have a pink and mint bathroom too in my mid-century rancher! I was horrified at first, but have grown to love and appreciate its vintage charm and uniqueness. It’s s special piece of history! Check out retrorenovation.com and savethepinkbathrooms.com for lots of inspiration – they helped me a lot. Great view and wonderful large windows. The kitchen appliances look like antiques! I can see some walls coming down in your future. 15 years ago I bought a Cape Cod style from the early 50’s and have been renovating inside and out every since. Almost done. Good luck with your journey with this house. I look forward to seeing how you change it. Wow! That basement offers a lot of extra space! Looking forward to the many updates and projects you’ll do to it. Love the sign near the end of the tour! Lovely home! Happy settling in. Does your garage flood when it rains? I can’t wait to see what you do to your new home! 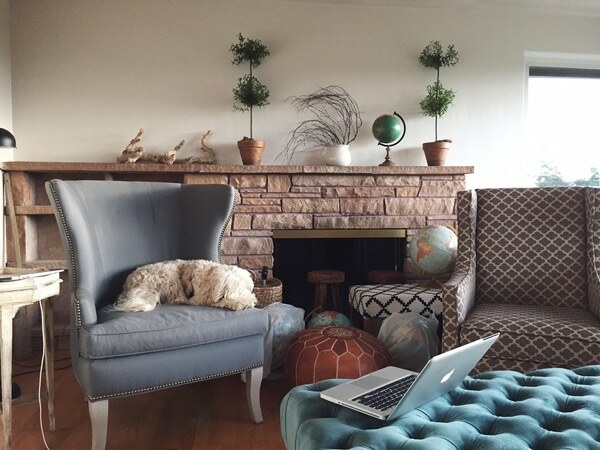 Last fall we bought a mid century ranch also….after selling our big cape that we had lovingly remodeled over the years. I just can’t seem to get motivated with our new place (still no pictures on the walls or curtains in the windows). Maybe you can motivate me! Congrats Melissa! Beautiful video and beautiful family. I can’t wait to see what you do with the place. Your house is adorable! Have fun making it home….wondering what part of Seattle this ….this is similar to what we would like to find as we are considering moving there…..(private with yard and bright) any chance this is North Seattle?